Gold declined Friday for the first time in three days, but still logged a sharp 3.7% weekly increase after having dropped one week ago to a three-month low. On Friday, gold for December delivery shed $8.40, or 0.6%, to settle at $1,314.60 an ounce on the Comex division of the New York Mercantile Exchange. Losses on the day were attributed to profit-taking and risker investment appetites. "People want to be in equities as the most lucrative investment," Michael Smith, the president of T&K Futures & Options in Port St. Lucie, Florida, said in a telephone interview according to Bloomberg News. "Also, there is some profit-taking after the big rally" in gold, he said. In dollars, the yellow metal surged $46.40 from its $1,268.20 an ounce closing last week, which was the lowest settlement price since July 10. Most of that came from the near $41 rally on Thursday. Last week, leading gold surveys weighed heavily bearish in their forecasts — incorrectly, as it turned out. This week, surveys are more bullish than bearish. Friday’s survey from Kitco News had 10 participants expecting gold to move higher next week, 7 seeing them lower and 8 expecting prices to move sideways or unchanged. "Those who see higher prices next week said they believe gold will benefit from investors who are rethinking their views of the U.S. government and the dollar after another last-minute deal by Congress to fix a stalemate," noted Kitco News. "Those who see weaker prices said nothing with gold’s price outlook has changed now that the congressional stare-down is over, while others said the Thursday rally has made gold seem a bit pricey… A number of survey participants said they were either neutral on the market, wanting to wait until after the nonfarm payrolls report to get back into gold…"
Bloomberg News reports its survey has 16 participants forecasting higher gold prices next week compared to 9 who were bearish and 2 neutral. Silver tracked gold lower on Friday while PGM’s moved higher to extend their winning streaks. As for their weekly breakdowns, silver jumped 3.1%, platinum soared 4.5% and palladium surged 3.8%. Silver for December delivery dipped 3.4 cents, or 0.2%, to finish at $21.91 an ounce. Up for a third straight session, January platinum rose $2.90, or 0.2%, to $1,437.80 an ounce. Gaining for the sixth time in seven sessions, palladium for December added $2.85, or 0.4%, to $740.65 an ounce. Gold coins gained 19,500 ounces compared to last week’s 10,000 ounces. Sales splits for the week summed to 13,000 ounces in 22-karat American Gold Eagles and 6,500 ounces in 24-karat American Gold Buffalo coins. 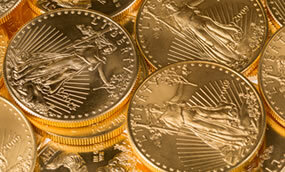 On a monthly basis, sales of Gold Eagles are at 25,000 ounces. That snaps a five-month declining trend and is just 1,000 ounces away from doubling last month’s total. October sales of 12,500 Buffalo gold coins have surpassed their prior two monthly totals of 10,000 coins. Silver coins rose 800,000 ounces compared to last week’s 703,000 ounces. Sales came entirely from American Silver Eagles. Their sales pace is handily on track for an annual record. Year 2011 currently holds that record at 39,868,500 coins. That year, it took until until Nov. 30, 2011 for sales to reach where they are now. In related coin news on United States Mint products but produced for coin collectors, the bureau this week released Woodrow Wilson $1 coins. With the week’s gain in silver, melt values of silver coins for the month also turned positive — through they remain well off for the year. Displayed in the upcoming table are melt values of older circulating U.S. coins that were produced with 90% silver. These coins, at least those that have little to no numismatic worth because they are too common or too worn, are the ones often sought for their silver values. The above melt values are calculated using London fix silver prices at the end of 2012 and September and on October 18, 2013.